There’s no doubt, Thanksgiving can be a hectic holiday. Cooking all the meals, managing the family and making sure your house is guest-ready can make you want to run and hide under the bed. It’s so easy get caught up in all the busyness and preparations and miss out on what’s most important; spending quality time with ohana and friends. 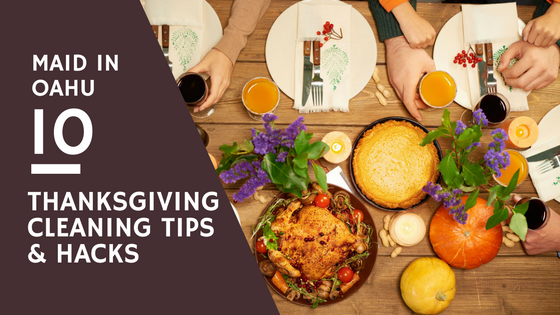 Since cleaning your house is probably the last thing you want to add to the list, we came up with this list of 10 Thanksgiving cleaning tips and hacks that will hopefully help you get your house fresh for Thanksgiving without losing your sanity. #1 Gravy Stain Remover: Need to get gravy or sauce stains off your carpet? Start by scraping up the excess gravy and sprinkle baking soda, cornstarch, or anything else absorbent on the stain. Let stand for 10 to 15 minutes, and then vacuum it up. #2 Quick Cold Beer: Get warm beer cold in an instant by wrapping it in a wet paper towel and placing it in the freezer for about 15 minutes. #3 Hit The Floor: If you only have time to thoroughly clean one surface, sweep and mop / polish hardwood and other smooth floors to make your whole home look spotless. #4 Emergency Stain Kit: Prepare an emergency carpet stain kit that includes a mixture of one part vinegar to one part water and microfiber cloths for blotting (not scrubbing!). #5 Greasy Dish Fix: If you have a lot of greasy dishes, mix in a few spoonful’s of white vinegar into the water you soak the dishes in to help cut grease. #6 Spud Cleaner Hack: Save time scrubbing your potatoes by running them through the rinse cycle in in your dishwasher. #7 Turkey Flavor Saver: Keep the best flavors in your turkey by deep cleaning your oven naturally with one part vinegar, two parts liquid soap, six parts baking soda, and water to make a paste to dissolve the grime on the inside of your oven. #8 Trash Saver: Double-line your trash cans to prevent rips from overloading your garbage. #9 DIY Wood Polish: Save money and time by making your own wood polish using water, liquid castile soap, and essential oils. Your guests will be impressed with your uber shiny dining room table! #10 DIY Sink Shiner: A few drops of baby oil on a soft cloth will turn dull sink fixtures into perfect mirrors. P.S.  : Stay tuned to our blog or social media for special Cyber Monday deals and discounts on house cleaning and carpet cleaning!